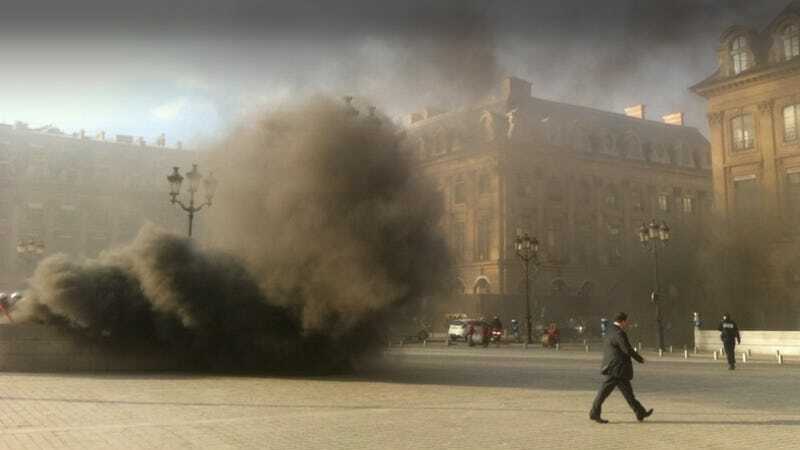 A fire that started yesterday is raging in the underground garage of Paris's Ritz Hotel below the Place Vendome, allegedly caused by a Ferrari that burst into flames. The garage is typically full of exotic cars and damage could be well over $6 million once the fire is extinguished. Because, yes, the fire still isn't out yet. All we can be sure of at this moment is the specific swanky parking lot in Paris was set ablaze due to a car catching fire earlier today and the structure is still, at this moment, sending thick black smoke into the sky. As supercars tend to congregate in the garage and Ferraris are so well known for self-immolation we consider the information credible enough, for now. The damage estimate comes from GTSpirit who say they put it together after multiple conversations with "insurance experts." It's impossible to know without eyewitness accounts or photography exactly what cars were in the garage at the time, but the number isn't as extreme as it seems. Just two Bugatti Veyrons and you're more than halfway there, plus the Ferrari. Anyone in Paris near the scene of the fire? UPDATE: The fire is out, but not before damaging more than 30 cars.